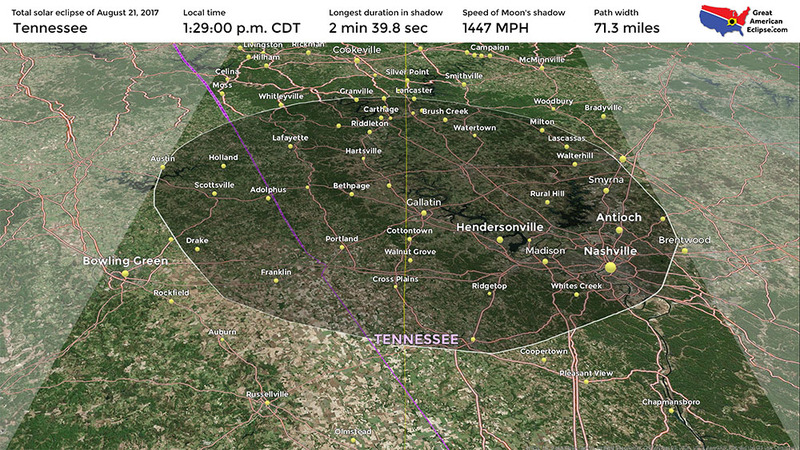 Total solar eclipse over Tennessee. 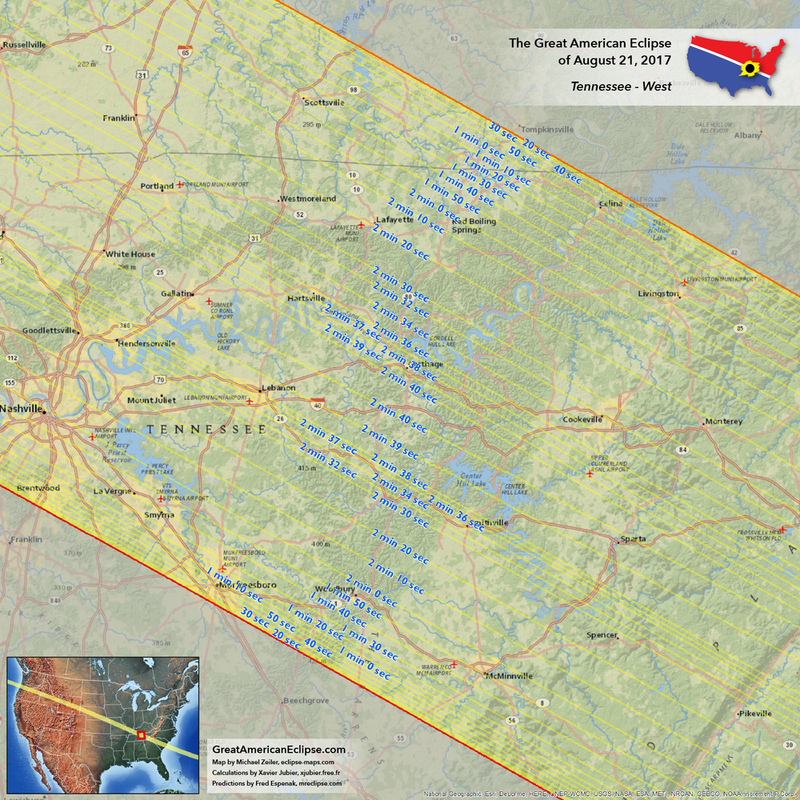 Tennessee eclipse. Great American Eclipse. 2017 solar eclipse. Solar eclipse 2017. 2017 eclipse. 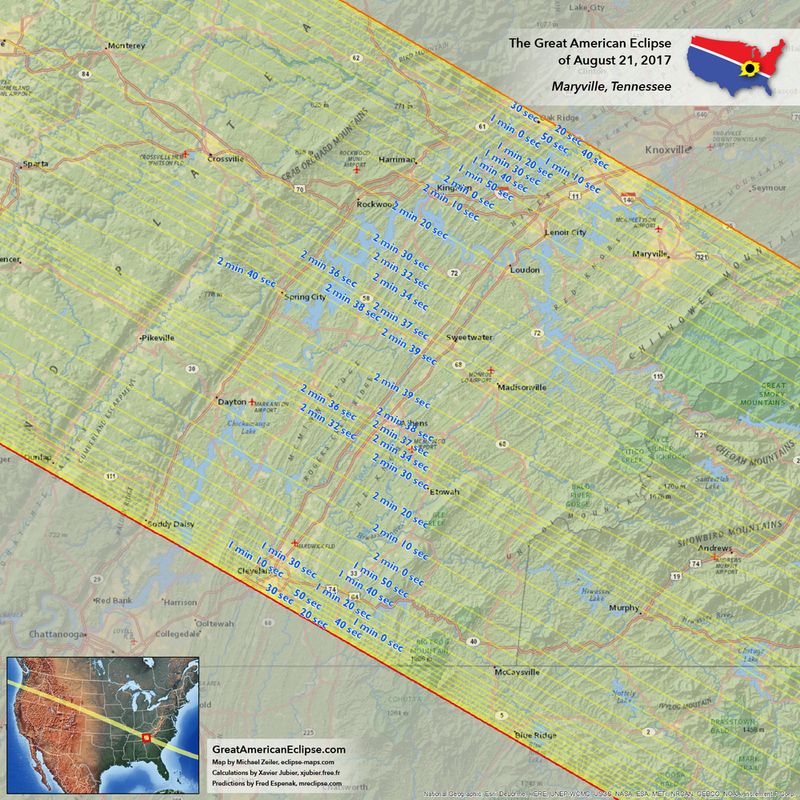 The eclipse neatly bisects tennessee, a prime area for viewing the eclipse. 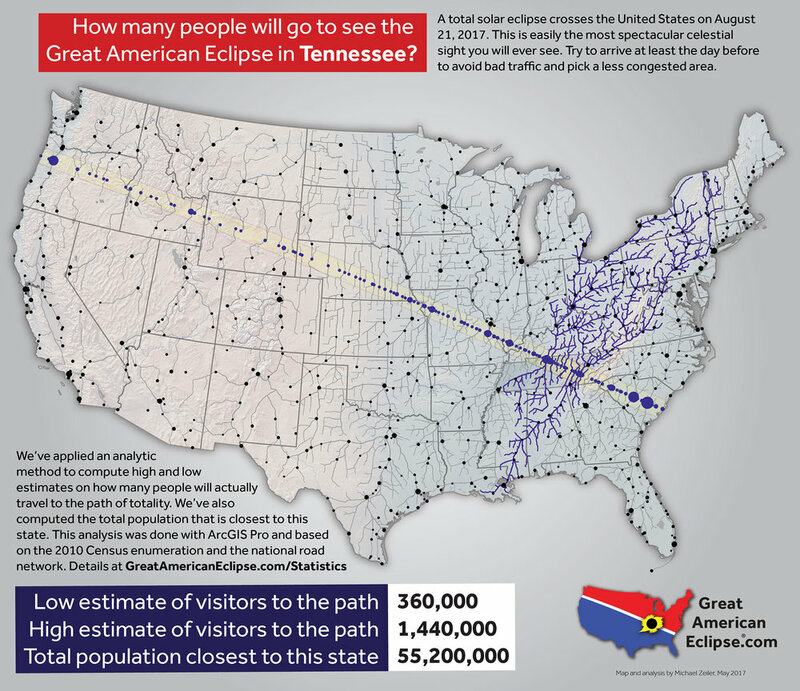 One of the major cities visited by the eclipse is Nashville, Tennessee. 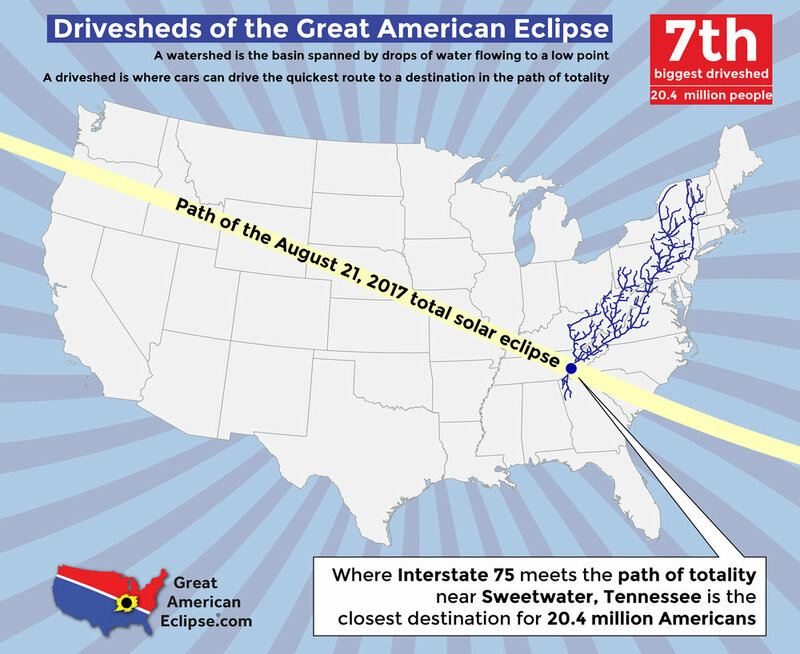 Folks in Nashville will be singing about this eclipse for years to come as it is the largest city wholly within the path of totality. 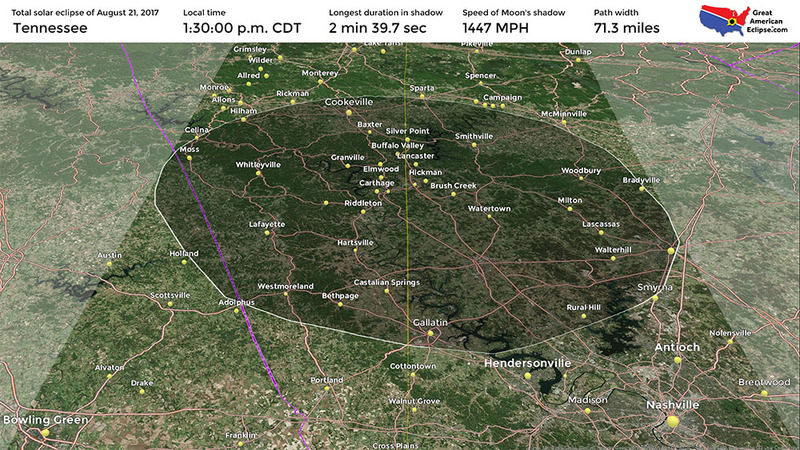 Clarksville experiences 2 minutes and 19 seconds of totality. 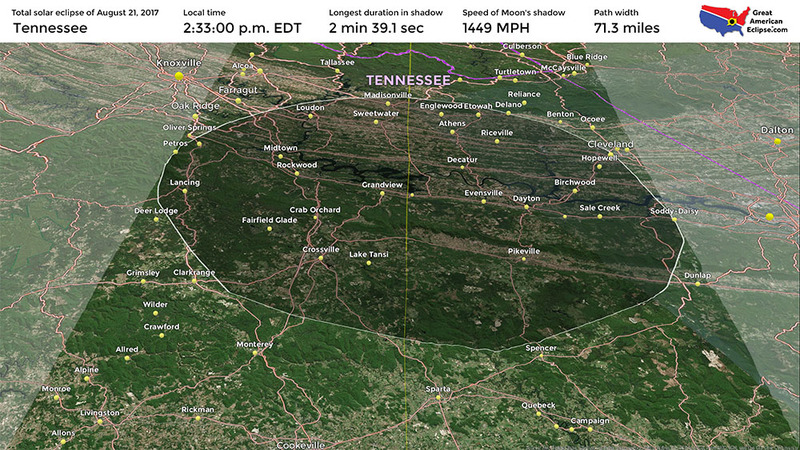 Gallatin gets 2 minutes and 40 seconds of darkness. 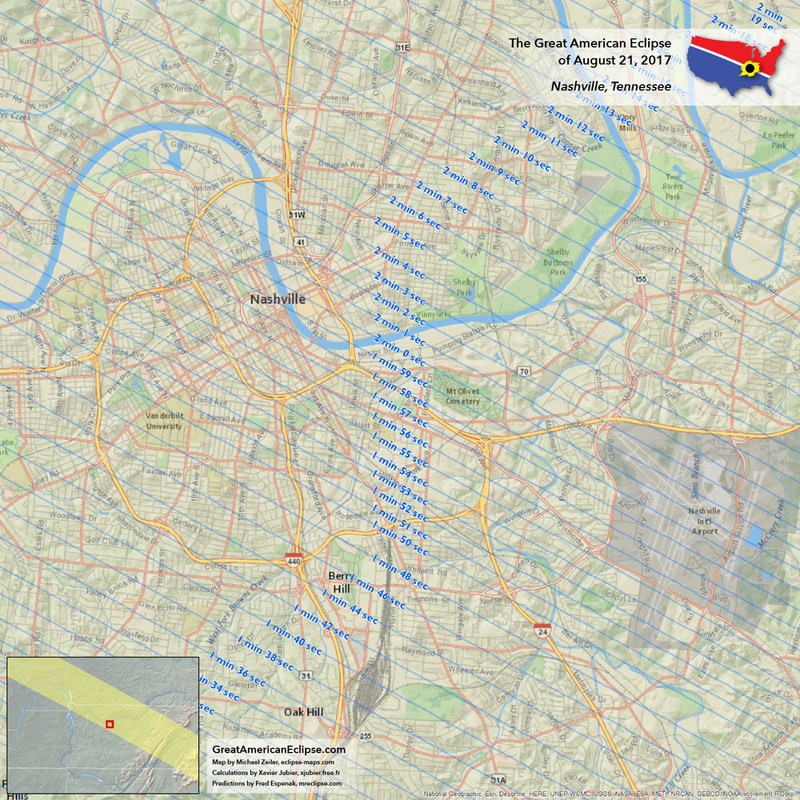 While Nashville is not far from the southern limit of the path, it still receives a respectable 1 minute and 57 seconds. 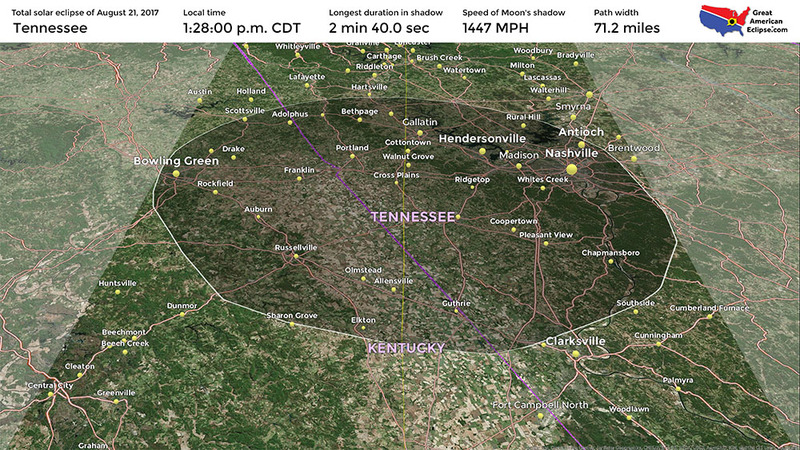 Lebanon gets 2 minutes and 37 seconds and Cookeville receives 2 minutes and 32 seconds.Oak Ridge and Knoxville are just outside the path of totality and people there would be urged to drive about 40 or 50 miles south or west. Madisonville is on deck for 2 minutes and 37 seconds. 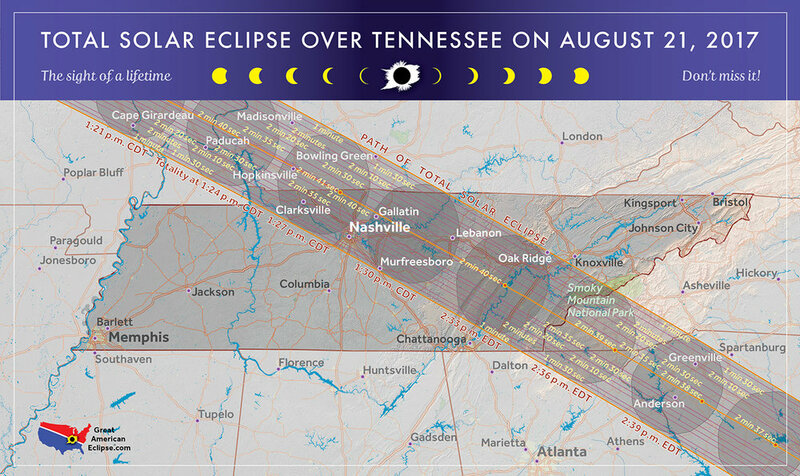 The total solar eclipse first enters the state at 1:25 p.m. CDT and leaves the state at 2:36 p.m. EDT (there is a time zone change within Tennessee). 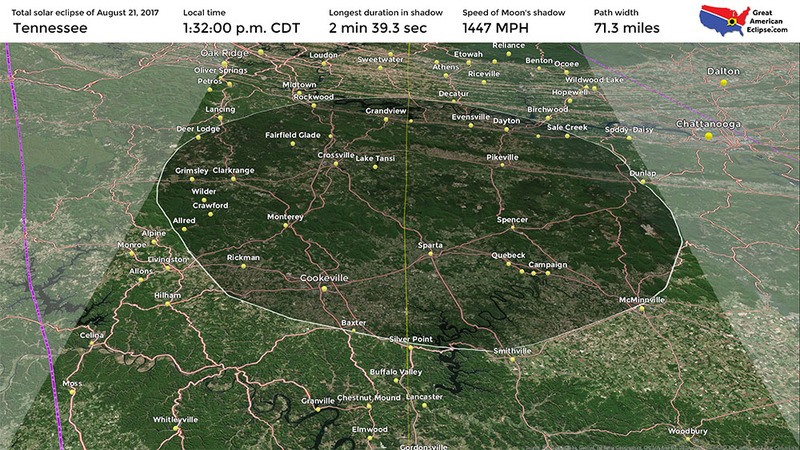 Within the state, the Moon's shadow rushes at about 1,800 miles per hour! The weather forecast in August is fair. See eclipsophile.com for details. 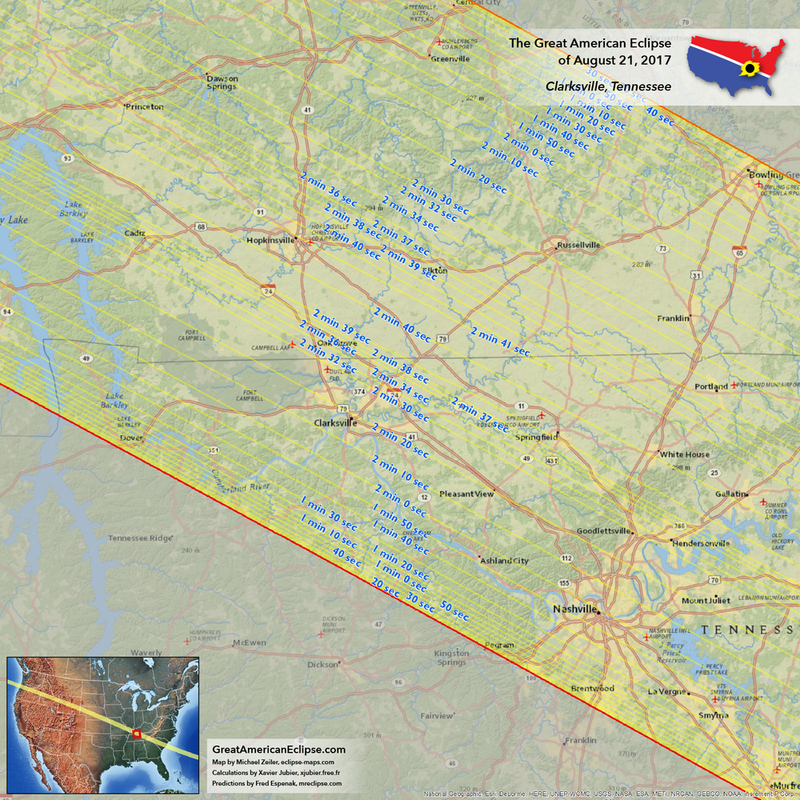 Hopefully, the weather will cooperate on eclipse day in Nashville and other parts, but the smart eclipse chaser will study the short-term weather forecast and drive to where clear skies are forecast.